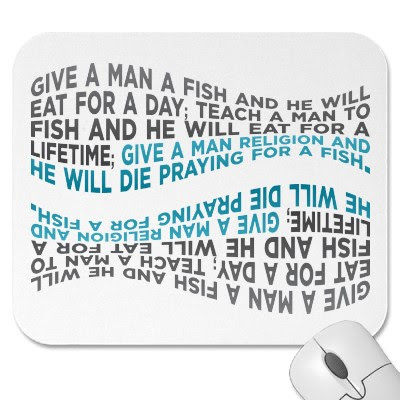 Give a man a fish and he eats for a day. Teach a man to fish and he can feed himself for life. (Chinese Version). Give a man a fish and he has food for a day; teach him how to fish and you can get rid of him for the entire weekend ~ Zenna Schaffer. Nobody has taught me how to fish. Otherwise I won't be sitting here to blog on the weekend. U are lucky coz your young children are too happy to follow you to fish. Non of my grown up kids are with me now. Even the grand little children are abroad with their parents. I hope their father would take them to fish. Otherwise they might not have the time in future. Perhaps have to ask whether little darling is interested to fish with me. But you know ladies seldom like to fish coz they are afraid of the sun. Otherwise have to fish along with you one day. Haha!! !